Time: Greens sale and cookie walk at 9AM at the Senior Center. 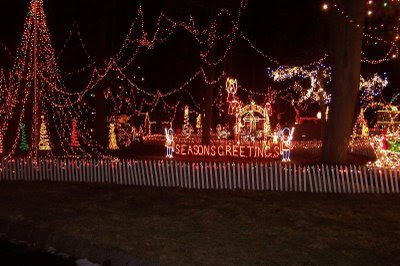 At 10AM you are invited to view five houses decorated by the Bridgewater Garden Club. Tickets available at Bridgewater Florist, Matta Dance and Forever More Country Store. Tickets cost $20.00 in advance and are available for $25.00 at the door. The Bridgewater Highway Department has openings for part-time seasonal truck drivers to assist with snow and ice operations. A Commercial Driver’s License (CDL) Class A or B is required.The hourly rate is $25.00 per hour. These are temporary part-time positions and do not include benefits. Actual working hours will be on an as-needed basis.Interested persons should apply in person to the Bridgewater Highway Department, 151 High Street, Bridgewater, MA 02324. Bridgewater Little League would like to invite you to fundraising meeting for the new concession stand being held on Monday December 1st at 7:00PM upstairs at the Vets Club. We are looking for people with fundraising ideas that would like to get involved with this favor important project. Bridgewater Little League is expanding and we need your help. We have undertaken the major task of building a brand new concession stand. We have received a generous donation of $20,000 from Mechanics Cooperative Bank of Bridgewater but that is only a portion of what is needed. The rough estimate for a fully operational concession stand is $60 to $70K. The concession stand is the lifeline of our organization. Most, if not all, of the money raised goes to paying our umpires, awards, field maintenance and 12 yr old graduate sweatshirts. Without these monies we could not supply our children with the quality of a program that they have grown accustomed to and that we demand of ourselves. While we definitely understand these are trying times that none of us have ever seen, BLL has decided that this is the time that we need to go out to the community to secure the future of our league. What you might consider a small donation could mean the world to us. Thanks in advance, and hope to see you at the meeting. Around the Common wishes you and your family a very happy and safe Thanksgiving. Based upon last week's poll results, Bridgewater residents agree that the election cycle for the office of Board of Selectmen should remain as it is and all five Selectmen should not be elected at the same time. The Bridgewater Knights of Columbus will be hosting a Meat Raffle on Saturday from 1 p.m. to 3 p.m. at 582 Bedford Street behind the National Guard Armory. Afternoon jazz sessions will feature performances by local public school students as well as other guest artists. The festival concludes with an evening performance in the Horace Mann Auditorium located in Boyden Hall at 7:30 PM. The jazz festival is free and is open to the public. For more information about the Bridgewater State College Jazz Festival, please click here. The Bridgewater Democratic Town committee will hold its annual holiday party at Barrett's Ale House, Route 18 in Bridgewater on Tuesday, December 9th at 7PM. The party will benefit the Reach Out and Read Program, which provides free books to children in need. The program has been ongoing for some time and the books are donated to MA General and over 200 hospitals and clinics in MA. Reach Out and Read trains doctors and nurses to advise parents about the importance of reading aloud and to give books to children at pediatric check-ups from 6 months to 5 years of age, with special focus on children growing up in poverty. The cost for the holiday party, which includes pizza, is $15 with all proceeds going to Reach Out and Read. For every $2 donation that the Reach Out and Read Program raises an age appropriate and developmental book is given to a child in the Commonwealth of Massachusetts. By purchasing a ticket for the holiday party you will help provide books to children and at the same time enjoy an evening out with friends. If you are interested in attending this great fundraiser to help provide children with books and increase literacy here in Massachusetts, please RSVP by clicking here. If you cannot attend the fundraiser/holiday party, please feel free to send a donation payable to Reach Out and Read to Attn: Kevin Bligh 6 Heather Lane in Bridgewater. 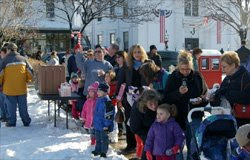 This annual holiday event is held on the Bridgewater Common (even in the snow!). Bring the family to meet Santa, listen to music, ride ponies, and drink hot chocolate. Donations for Toys For Tots, with help from the US Marines, are welcome. BBA Members are encouraged to participate. On Saturday from 2 p.m. to 3 p.m Theaterworks USA, a New York-based children's theater company, will perform "The Lion, The Witch and The Wardrobe." It's a musical based on C.S. Lewis' adventure of four children transported to the fabled land of Narnia. The production is considered suitable for kids in grades 1-7. Proceeds from the $10 general admission ticket sales will be used to buy books for the high school library. For tickets call 508-697-6902 x21204 and they will also be available at the door. St. Thomas Aquinas Church in Bridgewater will hold its holiday bazaar on Saturday from 9 a.m. to 3 p.m. As part of the event they will raffle a set of numbered, large, Seraphim ceramic angels and a number of dolls, including four Wendy Lawton Little Women dolls, in a silent auction. For more information, call the rectory at 508-697-9528 between 8 a.m. and 4 p.m. The event will also feature a toy room, a children's craft room, pictures with Santa, home baked goods and candy, assorted home sewn and knit items, plants, and an extensive holiday craft room along with vintage jewelry and a white elephant room. The Friends of the Library are sponsoring a coffee sale to raise money for the library. Bridgewater Brew is both a Fair-Trade and organic coffee. The medium roast is $9.00/lb and the dark roast is $10.00/lb. There is also organic hot cocoa mix available for $6.00/12 ounce package. Order forms available at the library's Circulation Desk. The Board of Assessors is accepting applications for a member until 1PM on this Friday, November 21st to fill a vacancy due to a resignation. The term runs until the 2009 Town Election when the interested individual can seek re-election. The Assessors are responsible for the evaluation of real and personal property. The vacancy will be filled by a joint meeting of the Board of Assessors and the Board of Selectmen on November 25th at 6:30 PM. A letter of interest along with qualifications should be sent to the Board of Selectmen at 25 South Street in Bridgewater or can be sent via email to psullivan@bridgewaterma.org. Click each photo for an enlarged version. Handcrafted items, gifts, cookie walk, homemade soups and breads, and visits with Santa at 12 and 2 PM! Just one block off the Bridgewater Common at First Parish Unitarian-Universalist Church, 50 School Street. For more information, call 508-697-2525. The Bridgewater Community Lions Club will host the Arts for Everyone Festival tomorrow from 9 AM to 4 PM at the Bridgewater Middle School located at 166 Mt. Prospect Street. The festival will include an arts and crafts fair, an art exhibit featuring the work of 11 to 13 year old contestants to the Lions International Peace Poster contest as well as the Bridgewater Senior Painters, and performing arts such as dance, instrument and voice. Admission to the Arts for Everyone Festival is $2.50 per person with children 6 years and under being free. Following up on last week's election related poll question, this week's poll question deals with the election of Selectmen. Should all five selectmen be elected at the same time? Proponents would look to many other cities and towns that elect an entire body of Selectmen or City Councilors all at the same time and would argue that rather than holding a possible election race each year holding one ever few years would allow for more consistency on the board. Opponents would argue that the town could run the risk of having all five Selectmen voted out of office leaving an experience void on the Board. Make sure you vote and tell us your thoughts by emailing Around the Common..
Around the Common readers have spoken and overwhelmingly endorse moving all elections in town to the standard November election date. From a cost perspective, this would help to alleviate holding potentially two elections in the same year and would allow for election continuity. Furthermore, if the town elections coincided with a state or national election, voter turnout would increase for the local ballot races. Phase II of the Elm Street sewer extension and sewer service construction has begun. The project is scheduled for completion in the spring of 2009. Any questions please call the Sewer Department at 508-697-0937 Monday through Friday 7 a.m. to 3:30 p.m. Remember to please drive with caution. The Bridgewater Garden Club will be holding “Winter Frolic”, a house tour including 5 beautifully decorated homes for the holidays on Saturday, December 6 from 10 A.M. until 3:00 P.M. Tickets are $20.00 in advance and $25.00 the day of the tour. Tickets are available in Bridgewater at Bridgewater Florist, ForeverMore Country Store, Matta Dance Studio or, in East Bridgewater at MS. Bee Haven. Tickets may also be purchased by sending a stamped, self addressed business envelope to: Bridgewater Garden Club, 60 Forest Drive, Bridgewater with a check made payable to the garden club. For additional ticket information, call 508-697-7617. The Christmas Green sale will be held at the Senior Center also on December 6 from 9A.M. until sold out. Wreaths, centerpieces, hollies, bags of greens and bows are available. The holiday baking can be done easily by buying at the Cookie Walk. Friends may buy an empty can for $4.00 and fill it with a variety of cookies of their choice. All profits benefit the scholarship fund, civic beautification and other programs. The Bridgewater Lions Club annual television auction will be held tonight from 5 PM to 10PM on BTV Channel 9. Bidders can bid on great auction prizes like vacation getaways, gift certificates to restaurants, beauty, fitness home improvement and crafts and other collectibles. Make sure you turn into BTV Channel 9 so you don't miss out on the amazing items up for bid. To place a bid, please call 508.697.9590. All proceeds from the auction will benefit the Massachusetts Lions Eye Research Fund, Inc. The Bridgewater State College Music Faculty will host their faculty showcase on November 13th at 7:30 PM in Boyden Hall's Horace Mann Auditorium. All proceeds from the event will go toward music scholarships. Admission is open to the public and tickets are $5 with BSC students' admission being free. For more information, please call 508.531.1377. Click here for a copy of the warrant. Registration for Bridgewater Girls Softball will be held on Saturday, November 15th at the Senior Center from 8:00 a.m. to 2:00 p.m. For more information, contact Jim Polk or at 508-807-0889. Registering on the 15th guarantees a roster spot for the 2009 BGSL season. With a major turnout at this week's election, is it time to change the timing of local town races? Would you support changing the town elections to November rather than April to allow for a more regular election cycle? Would it allow for an easier budget process and or eliminate a new Selectman being thrown right into Town Meeting? Cast your votes now and if you have comments on the topic please email Around the Common by clicking here. All comments will be kept without names or emails associated. The Central Square Congregational Church will hold their annual Country Bumpkins Fair this weekend. Dates and Times: Friday, November 7th from 6:30 PM to 8:30 PM and Saturday, November 8th starting at 9AM. Both days you will be able to purchase homemade crafts, jewelry, baked goods as well as take your chances in the silent auction. Don't miss fresh pie and coffee on Friday night or a great lunch on Saturday. Come enjoy arts and crafts, fresh baked goods, a silent auction and other items for sale. Food will also be served so bring your appetite. (Bridgewater , MA ) Betrayal, Power, Madness & Murder. The story of Hamlet has been told for centuries...but it's never been told like this! East Bridgewater native Don Sheehan puts his unique twist on this Shakespearean classic by adding a rock band and a female Hamlet. Hamlet portrayed by Wendy Lippe, senses betrayal in her royal father's death and devises a plan designed to uncover the truth of his untimely demise. The cast including Artistic Director Don Sheehan, Lisa Tosti, Michael Pevzner and Dane Grigas unravels the story so well, that even if you aren’t a Shakespearean enthusiast you’ll be on the edge of your seat as this treacherous tale unfolds. “Hamlet” will be presented Friday and Saturday evenings at 8pm November 14th & 15th and 21st & 22nd at the Eldon T. Cole Parish House, 15 Cedar Street , Bridgewater , MA . Admission is $25 per person, $20 for Seniors & Students... Tickets purchased in advance will be discounted $5 per ticket. Call 508-532-2738 for advance tickets and group rates. A Silent Auction will be held at the opening night performance to aid in raising funds to support the development of theatre education programs, Sporadic Evolution Theatre’s 2008-2009 Season, and on going church ministry and mission projects. Tuesday November 4th is Election Day. Did you ever think it would arrive? Polls are open from 7:00 AM. to 8:00 PM at the Middle School (Former Bridgewater Raynham Regional High School Building) at 166 Mount Prospect Street. The Bridgewater State College men's basketball team will hold a clinic at the Tinsley Center on November 11th. The pre-registration fee is $30 and the fee is $35 on the day of the clinic. For more information, call the basketball office at 508-531-2896. Free presentation by Dr. James Hayes-Bohanan. Time:10:30 a.m. and again at 12 noon. Coffee and coffee cake will be served. Please RSVP by sending an email to the library at BWPL@sailsinc.org if you plan to attend the coffee presentation. Mr. Lundquist is a BSC alumnus and CEO of the Polus Center for Social and Economic Development located in Petersham, MA. He will discuss his work with the Coffeelands Land Mines Victims’ Trust and other community-based programs in Massachusetts and Worldwide. Cookies and Fair Trade coffee will be served. This event is funded by a grant from the American Library Association and Frontline World. For more information call 508.531.2893 or 508.531.2023. The Central Square Church Youth Group will be trick or treating this Halloween not for the normal Snickers and Milky Ways. Rather, youth group members will be going house to house in the Red Wing Road and Robin Road area along with houses on Glenmore Lane to collect canned good. The 7th to 12th graders will be dressed in Halloween costumes and will donate all of the canned goods they receive to the St. Vincent de Paul food pantry at St. Thomas Aquinas Church. Stone Meadow to hold its annual craft fair this Saturday, November 1, 2008 from 9 a.m. to 2 p.m. at the Stone Meadow Community Center, off of Plain Street. There will be crafts, a Victorian tea room, food court, baked goods, and raffles. Free admission. This event is hosted by the residents' association. A pre-town meeting will be held this Tuesday, October 28th at the Bridgewater-Raynham Regional High School Auditorium. This meeting will begin immediately after the Board of Selectman finish their meeting, which will begin at 6:30 p.m. Please make every effort to attend this meeting meant to make Town Meeting run more smoothly. The schedule has been set for applications to the Community Preservation Committee for funding which will be voted at the Annual Town Meeting on May 4, 2009. The deadline for pre-applications, a mandatory step in the application process, is Thursday November 13, 2008. The Community Preservation Committee urges anyone with a project that will create Affordable Housing, preserve/ restore Historical Resources or create/ preserve Open Space to submit a pre-application for consideration. The simple pre-application form may be found on the town web site at http://www.bridgewaterma.org/CPA/Pre-app09-amended.pdf Submissions must be made electronically by 5 PM on Thursday November 13th to the Chair Marilee Kenney Hunt (Marilee@thehunts.org). For more information write to Marilee@thehunts.org or call 508-697-3681. The Around the Common poll voters have spoken and the outcome is a statistical tie amongst the respondents as to which Presidential campaign will win Bridgewater. On Tuesday, October 21, 2008 there will be a Triad Public Safety Expo at the Bridgewater Senior Center, 10 Wally Krueger Way from 11 a.m. to 3 p.m. There will be a K-9 demo and free raffles as well as a free lunch for the first 100 Bridgewater seniors who attend. For more information call 508-697-0929. What is DI? An after-school program designed to promote team-based creative problem solving. Teams work together to apply creative thinking and their individual talent to solve a Team Challenge. It’s a 16-week program where kids will learn skills that help them all through their lives. What’s a Team Challenge? It’s an academically based process driven project aligned with National Education Standards that emphasizes teamwork, problem solving, creativity, and improvisation. The Teams present their solution at a tournament in March competing against other teams within their same age group. So what’s different about this program? ALL WORK ON THE SOLUTION MUST BE DONE BY THE CHILDREN!! Let me put it another way…. Adults cannot tell the kids what to do!! Now how FUN is that?!? Their creativity, originality, teamwork and leadership is acknowledged and rewarded. They use ordinary household items, recyclables and trash to create their solutions. From Stephanie Guarino: I am running an online survey for a class project regarding Bridgewater citizens' feelings about the library. The survey is open until November 7th and is anonymous. Your answers will be used for a final presentation in my graduate class at Suffolk University, and may be used by the library trustees to determine projects that should be continued/expanded. If you know of anyone who would like to take the survey but cannot visit the blog, that link can be emailed. I will also have hard copies at the Library starting Tuesday, October 21st. Should you have any questions or concerns, please email Stephanie Guarino at stephanieguarino@yahoo.com (please put Survey for Bridgewater Library Cardholders in the subject line). Thanks for your help! The Bridgewater Little League Board members are looking for help down at the fields on Sunday October 19th starting at 8:30AM. They will be grooming the fields in preparation of the winter. They have purchase infield mix to add to the Senior League and two Major League Fields. BLL also need to take down the batting cages and put away the L screens for the winter. If you can please give us a couple of hours of your time on Sunday morning it would be greatly appreciated. The kids and parents will also appreciate the field conditions next spring because of your efforts. Bridgewater Little League is holding their annual Awards Night on Sunday October 19th @ 7:00PM at the BR High School Auditorium. Bridgewater Cub Scout Pack 88 needs your help. They are trying to raise money to replace their Pinewood Derby Track. Their current track is over 20 years old and can't be fixed any longer. The Pack will be holding a can and bottle drive on October 18th at Bridgewater Bottle and Can Recycling on Hale Street near the RR Tracks from 9 am to 3 pm. You can bring them over and just drop them off and tell them they are for the Scouts. If you need help or have too many call (508) 697-8078 to arrange a pick up. The Bridgewater State College Theater Department is proud to present their fall production of W.A. Mozart's, The Magic Flute. The opera will be presented in English by various professional and advanced student actors. Student, group and senior citizen rates available. For further information please contact the box office at 501-531-1321. Based upon last week's poll results, the consensus amongst Around the Common viewers is that the time has come to move from an Open Town Meeting to a Representative Town Meeting. Games, Refreshments, Treasure Hunts with a real pirate, and prizes! Create the most disgusting looking, delicious tasting dessert and you could win a cash prize! Must call and register by October 25th. Carve it, Paint it, Stick things into it, Mold it, Sculpture it! Bring your pumpkin the day of! We judge based on creativity, not skill level! Winners announced at 8pm. Come dressed up! Winners announced at 8pm. This year there are over 15 volunteers helping with this event! Amazing ideas for games and decorations are being put into action, and most are handmade! There is even talk about a giant 'operation' game....but we cant give all the details away!!! Come by and find out! "My Body, Their Baby is the candid, bittersweet story of two women who pulled off a miracle, then had to face the consequences. With raw emotion, Miller describes the heartbreak of discovering that her long-time friend is a complete stranger." Can anything compare to the friendship between teenage girls? When Laurie and Meg met at camp in the summer of 1974, an immediate bond was formed. They giggled late into the night, had crushes on boys, and almost got caught smoking. As years went by, Laurie got married and had two children. Meg, dealing with a lifelong illness, married too, but conceiving and carrying a child was very risky. Laurie's idea to carry Meg's child for her led them down an amazing and magical path together, but triumph turned to tragedy in this powerful, engrossing account of friendship pushed to the limit. To purchase the book, please either shop directly from the publisher by clicking here or through Amazon.com by clicking here.